Scientists are now able to monitor generalized patterns of land-use rather than pixels of land cover, allowing for proper analysis. BOGOR, Indonesia (12 July 2013) – A new tool designed to evaluate the impact of swidden on forest degradation could play a key role in monitoring REDD+ climate change mitigation programs, according to scientists. The REDD+ framework puts binding obligations on industrialized countries to reduce global warming caused by greenhouse gas emissions resulting from deforestation and forest degradation. Debates over how to monitor, report and verify carbon emissions have been sticking points in global climate change negotiations. “For a future REDD+ scheme, accurate identification of deforestation and forest degradation and linking these processes to land use is crucial,” said Jean-Christophe Castella, a Laos-based scientist with the Center for International Forestry Research (CIFOR) and the Institute of Research for Development (IRD). “Until now, it has been a major challenge to distinguish degradation and deforestation from the temporal vegetation dynamics inherent in swidden,” he said. A swidden cultivation plot undergoes cyclical land cover changes from crop to fallow, to young forest, to secondary forest, to crop again. Over the past 30 years, land use intensity has increased in the swidden landscapes of Viengkham District in northern Laos, resulting in a shift from long crop-fallow cycles to short cycles, research showed. 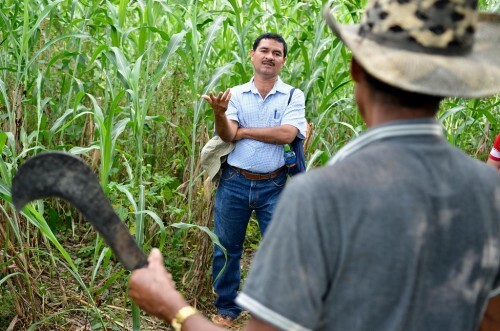 The shortening of fallow periods means that swidden – also known as slash-and-burn agriculture – may contribute to forest degradation because cleared woody vegetation is not allowed to regenerate between two cropping cycles, Castella said. “Swidden systems are highly dynamic land-use systems in both space and time,” said Cornelia Hett, the lead author of “A Landscape Mosaics Approach for Characterizing Swidden Systems from a REDD+ Perspective. As part of the EU funded I-REDD+ project, we developed a novel method – termed “landscape mosaics” -approach- to detect variations of land use intensity within swidden areas from existing land-cover maps, Hett said. The conventional approach to mapping land use change is to look at pixels of land cover from two points in time – for each pixel of a satellite image you assess the land cover and then see if it has changed from one-land cover type to another, or if it has stayed the same, Hett said. Since it is rather the overall context, or the neighborhood characteristics rather than each single pixel by itself, which defines a land use system we created new spatial geometries – the mosaics. The mosaics do not describe land cover anymore, but land use and land use intensity. A map of landscape mosaics can be created for two points in time and the changes can be assessed from one mosaic category to another, Hett said. “So one mosaic might be ‘swidden system with 3-5 years of fallow period’, or ‘permanent agriculture’, or ‘natural forest’,” she said. The landscape mosaics approach can be used for landscape-level land use change and carbon monitoring in a swidden-compatible MRV (monitoring, reporting and verification) system where compensation received through REDD+ payments would help maintain swidden farmers’ livelihoods system and lifestyle, Hett said. Funding from REDD+ climate mitigation programs could allow for an increase in longer crop-fallow periods, extending the rotation, giving vegetation more opportunity to grow and enhancing the carbon stocks in the swidden landscapes, she said. “If people in this landscape could receive carbon credits for avoided forest degradation, a gradual reversion back to longer crop fallow cycles of the swidden system combined with improved fallow systems based on agroforestry practices could become economically attractive and technically feasible under the current population density in uplands”, Castella added. The landscape mosaics approach makes swidden landscapes visible on the maps and consequently also permits to detect deforestation and forest degradation accurately, which has not been possible with conventional methods of remote sensing, he said. This research was carried out as part of the CGIAR Research Program on Forests, Trees and Agroforestry, the Comprehensive Analysis of the Trajectories of Changes (Catch-Up) Program supported by CIFOR and the Institut de Recherche pour le Développement (IRD). and the Swiss National Centre of Competence in Research (NCCR) North-South. It has benefited from collaborations within the I-REDD+ project of the European Commission Framework Project (FP7-ENV-2010 ) and received financial supported by the Swiss National Science Foundation (SNF), the Swiss Agency for Development and Cooperation (SDC) and participating institutions. Q+A: Can the REDD+ climate change program produce measurable results in the next three years?